The #23 Nissan GT-R driven by Michael Krumm and Lucas Luhr won the qualifying and the championship race at Paul Ricard, at the seventh round of the FIA GT1 World Championship. Michael Krumm and Lucas Luhr move into first place in the drivers standings, and JR Motorsports takes over 2nd spot, just three points behind the All-Inkl.com Lamborghinis. From here, the cars are headed to China for the next event on September 4th. Nissan completed the double in the seventh round of the championship at Paul Ricard with the JRM Motorsports No.23 GT-R of Michael Krumm and Lucas Luhr taking the win in the Championship Race to add to yesterday's Qualifying Race victory. The German pair were able to control the race from pole, complete a rapid pit stop and take their fourth chequered flag of the season. In overcast conditions suited to the Aston Martins, the Young Driver cars were second and third. The No.8 of Darren Turner and Stefan Mucke led home the sister car of Tomas Enge and Alex Muller - a reversal of the placings from the Qualifying Race for the Astons. David Brabham and Jamie Campbell-Walter, starting from 11th position, produced a spirited performance to claim fourth place. The Hexis Aston No.4 of Christian Hohenadel and Andrea Piccini took fifth while Maxime Martin and Fred Makowiecki flew the flag for Ford with sixth place in the Marc VDS Ford GT No.41. The unluckiest of the Nissans was the No.22 JRM car of Peter Dumbreck and Richard Westbrook which limped back to the pits with a suspenion problem with five minutes remaining. The British duo were fourth in the Qualifying Race and were threatening a podium position in the main event when fate conspired against them once again. The All-Inkl.com Munnich Motorsport No.38 of Markus Winkelhock and Marc Basseng was running strongly in the top four, before being handicapped by a slow pit stop and finished eighth. It was a torrid race for the Corvettes. The Exim Bank Team China No.11 of Mike Hezemans and Andreas Zuber retired on the opening lap after running wide and bounced over the kerb on the exit of turn two and sustaining front tyre and under body damage. It was the second retirement of the weekend for the pair. The DKR No.47 of Michael Rossi and Dimitri Enjalbert made a solid start from the seventh row on the grid but eventually finished 10th. The result puts a completely different complexion on the drivers' standings. Krumm and Luhr take over at the top with 111 points. Basseng and Winkelhock, the leaders prior to the Paul Ricard weekend, drop to second on 97 while Hohenadel and Piccini remain third on 84. 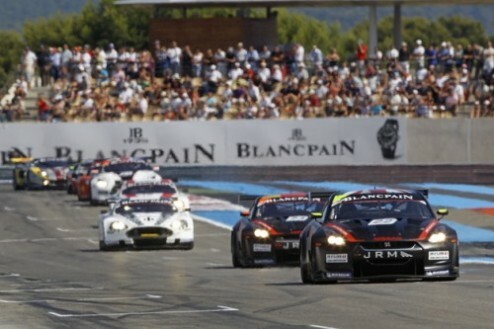 JRM (166) also closed the gap on All-Inkl.com Munnich Motorsport (169) in the teams' championship. Young Driver moved to third on 159. Nissan Gt-r is indeed a very beautiful car. At far it may look simple but inside it is a big deal of a car.